Two FBI agents track masked killers through three eye-witness accounts. Each victim has a completely different story of the crime leaving the agents to piece together what is reality and what is false of the vicious murders. It however becomes evident that the youngest witness knows more than she is letting on. "Surveillance" is a slow-paced thriller that focuses on it's performances to weave the bloody accounts of the two masked serial killers spree. The crime drama unfolds through eye-witness accounts that are both fictitious and revealing. Jennifer Chambers Lynch delivers a interesting script that is both compelling and elusive but in the end is a bit too easy to read through. Bill Pullman and Julia Ormond are outstanding in the film. Pullman delivers a haunting performance that reminds me what I use to love so much about him. Ormond is letter perfect in her performance and has some very touching scenes shared with Ryan Simpkins. Ormond and Pullman have wonderful on-screen chemistry in "Surveillance" which helps to propell the sluggish and violent tale. The supporting cast does a good job of filling out the film. Michael Ironside, Kent Harper and French Stewart provide some good laughs along the way. While Harper and Stewart also give startling performances as two cops who seem to do anything but protect and serve. I felt Ryan Simpkins' character unfortunately, was the downfall to the film. Her performance and character were the main reasons the reveal towards the end is not so much of a surprise, but more of a I told you so. Simpkins does a capable job in her performance, but her character development is just simply too revealing. Despite the obvious twist in the film, I really enjoyed the short indie thriller. Jennifer Lynch has been gone from directing too long and I was very pleased with her most recent attempt. She had wonderful development for a story that is ultimately choppy and comes together in pieces leaving the viewer to puzzle together the real story. The film doesn't force feed you the story and slowly leads you to the outcome, which was a nice change of pace. Overall "Surveillance" was a decent effort by Jennifer Chambers Lynch. The film is a fun watch and has solid performances from the majority of the cast. It has a solid shock value to the story, with some enjoyable gore and grit along the way. 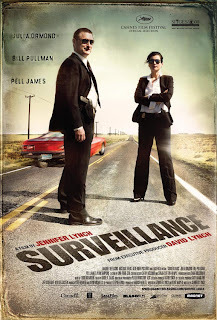 In the end, "Surveillance" isn't a very memorable film, but is in the end one that could definitely be watched numerous times and remain entertaining.